That's over €100 worth of products for your lovely lips. You have all the products you need to look after your lips and make them fabulous. What's better, you'll notice I didn't mention any shades (or in the case of Lush, flavours), that's because the winner can choose ANY shades/flavours they want. So do you have any colours you wanted to try out, but have been too afraid or perhaps you just need a couple more colours to finish off your collection? Now's your chance! 4. 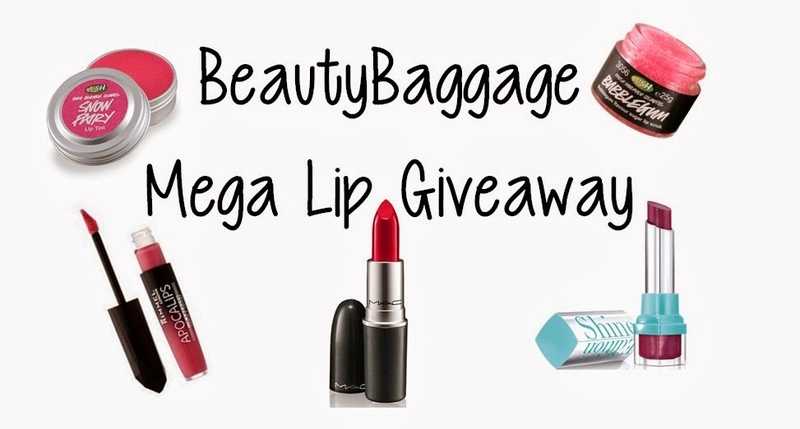 The winner will be announced on BeautyBaggage Twitter & Facebook pages later that day, so make sure to check back. To make it fair, I am using Rafflecopter. The more ways you enter, the better the chance you have of winning. For extra entries, you can tweet each day! Yeah I was hoping that would make it a better! Since myself and the winner may have very different taste! Happy to help with recommendations for anyone who is struggling to decide though! WOW! That is an amazing prize! Thanks for such an awesome competition. I'm glad everyone is happy with the prize :) I was racking my brain trying to think what to give, so glad it's going down well! This is one of the best giveaways, entered xxxx !!!!! super giveaway. i love all the products listed, especially Mac! great colours too. Oh I'm not sure if you read the full post properly? The above pics aren't the actual colours, the winner gets to choose their own shades, it's totally up to you! oh yes i did read that, i just forgot you could choose! i use an Apocalips at the moment and it's so highly pigmented and lasts a decent enough time too! Yeah they're great brands alright, glad you like them! Best of luck! It's randomised by Rafflecopter at least, would hate to have to choose! P.S so glad I found your blog, its a beaut!